The first record called “Pentalpha” is a one hour long song that tells a sad, romantic and very heavy -doomy story of someone’s first minutes of death. It was recorded at Inception Studios in different parts of the world ( L.A. , Stockholm , Barcelona …) and produced, mixed and mastered by Billy Anderson at SharkBite Studios ( Oakland , Ca). The release is set for October 24th, 2014 through Germany’s THE CHURCH WITHIN RECORDS ( http://www.doom-dealer.de ). AEONSGATE is the brainchild of Jondix (guitar player and founder of Great Coven, EIght Hands for Kali and Ätman-Acron). This time he is surrounded by amazing musicians. Mats Leven (Krux, Malmsteen, Therion, Candlemass,…) is the singer and his agonic and beautiful voice makes the song as sad and dark as you can get. Joseph Diaz is the mysterious bass player who played before with the likes of Graham Bonnet, Bobby Martin,…) And finally Marco Minneman (Kreator, Necrophagist, Steven Wilson,…) on drums playing in a trance inducing sabbathic progressive way strange in this musical genre. This doom opera song mixes 70’s, neoclassical and oriental elements and will be remembered as 2014 Doom’s ultimate epitome. 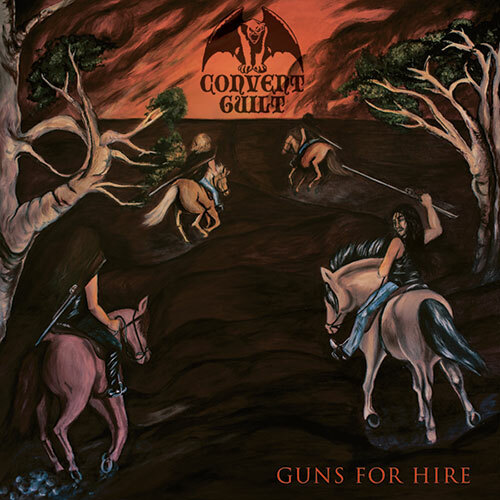 CONVENT GUILT announces today the artwork of their much anticipated debut full-length “Guns for Hire” which will be released on LP by Cruz del Sur Music and on CD by Shadow Kingdom Records. As you can see, the painting of these four heavy metal horsemen riding onto a barren horizon hints at the best graphic tradition of classics such as MANILLA ROAD, CIRITH UNGOL and other obscure and timeless classic hard rock and metal. This is what CONVENT GUILT from Sydney, Australia amply delivers: it sounds like a mix of the glorious and gritty ‘70s hard rock, the darker side of the NWOBHM and early ‘80s heavy metal from both sides of the Atlantic. Formed in 2010, the Guilt released their initial 4 track demo in mid-2012 and recently recorded their debut LP ‘Guns for hire’. Featuring veterans of the Aussie metal scene, CONVENT GUILT is a relatively new name – but it’s destined to conquer the heart and soul of any fan devoted to the early 80s metal sound. Raw, dirty and yet terribly catchy guitar riffs (some even hinting at early AC/DC!) will carry you back to the golden age of metal: song titles such as “Angels in Black Leather”, “Desert Brat” or “Perverse Altar” tell more of what you will get in this album than any words could… CONVENT GUILT‘s filthy vocals and its massive rhythmic section finally produce an overdose of muddy rock and roll that will find its best expression during savage live shows. 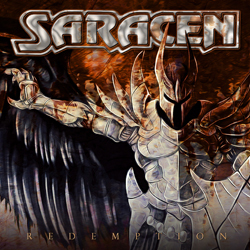 This is an album that smells of dust, sweat and energy – basically what metal is made of! Virginia’s long running epic metal legends are commemorating their 25th year with the release of their sixth full length album »Suspended At Aphelion« via Nuclear Blast this October. »Suspended At Aphelion« is undoubtedly their most ambitious, epic, and progressive album so far featuring a single track divided into 11 parts, performed by the entire »Fear Of Infinity« line-up as well as several esteemed guests, including FATES WARNING alumni drummer Mark Zonder and co-founding guitarist Victor Arduini – uniting two eras of FATES WARNING for the first time ever. The cover art for »Suspended At Aphelion« was once again created by Gustavo Sazes (MORBID ANGEL, ARCH ENEMY etc), and three separate audio masters were optimized for LP, CD, and digital download formats. WHILE HEAVEN WEPT also reunited with producer/engineer Kevin “131” Gutierrez (RAVEN, DECEASED, DYSRHYTHMIA) at Assembly Line Studios for the recording of »Suspended At Aphelion« 12 years after creating their classic »Of Empires Forlorn« album together, solidifying an already strong team for their most epic of epics!